The following narrative was originally written for the St. Petersburg Times. It never appeared, and I’ve modified it a little for use on our website. Our last cruise to the Antarctic took place from the 20th of July to the 1st of September, which is in the middle of the Antarctic winter. We routinely experienced temperatures between -25o and -30o C (-13o and -22o F) and wind chills as low as -60o C (-76o F). When it gets that cold we can no longer dive. Our breathing apparatus freezes before we can get in the water and our friends in the dive boat that help us with our gear (our dive tenders) are in very real danger of frostbite. Working on deck with nets is no picnic either. Before you can get your nets in the water, you have to first get them off the deck, to which they have been “welded” by ice and snow. Daylength varied from about 4 hours in the beginning of the cruise (10 a.m. to 2 p.m.) to about 8 hours at the end (9 a.m. to 5 p.m.) The winter pack ice was thick and hard, so going was tough. Our transits involved a lot of backing up and ramming through the ice. With this report I will give you a little more detail about what it is like to dive underneath Antarctic ice. Let me begin with the type of gear that we use. First, to protect us from the cold, we use a dry suit. A dry suit is basically a heavy rubber suit that has feet integrated into it, much like an old fashioned pair of long johns. It is sealed at the neck and cuffs with tight latex seals to prevent water from entering. It can be inflated like a big inner tube using a valve on the chest that connects to your compressed air cylinder. A corresponding exhaust valve is found on your left arm. Your arm is a handy place to have the exhaust valve, because you can raise it higher than your head and the air in the suit always finds the highest place to go to. What do you figure happens when you have a little too much air in your suit and you try to swim down? That’s right. The air goes into your feet and you find yourself floating up, upside down. To counteract this emergency we do a “tuck and roll” to bring our feet back beneath us, and once we are upright, hold our arms over our head to allow the air to rush into them. Under the suit we wear expedition – weight long underwear (polypropylene or another synthetic that “wicks” sweat away from your body) as our first layer, then a very thick polartec suit as our main barrier against the cold. Polartec is a comfortable synthetic that feels like fleece. On our feet we wear sock liners under a heavy pair of wool or wool/synthetic socks. On top of the socks go a pair of polartec booties that are same thickness as our suit. Between the socks and the booties (and this is a trade secret) go a pair of chemical toe warmers that work just great. They are a little bag of what feels like tiny pebbles that heat up when exposed to air. They last for 8 hours or so. I personally think that they are a genius – level invention. We are now ready to put on our dry suit. You enter the dry suit through a zippered cut that runs from one shoulder to the other. It is a lot like putting on a pair of tall boots or waders. First you make sure you have located the suspenders that hold the bottom of the suit up, then you slip your legs in. Your next task is to force your hands through the very tight latex cuffs that seal around your wrists to keep the dry suit dry. Your wrist or cuff seals are followed by jamming your head through the neck seal, which is the toughest part of donning a dry suit. You have to have a buddy make sure your neck seal is sealed properly all the way around before you ask them to zip you up. Your face and head are protected by a neoprene “ice cap” and by the suit’s integral dry hood. The ice cap is a hood that goes over your head and face much like a halloween mask, with holes for your mask and your breathing apparatus. Over the ice cap you stretch the suit’s latex dry hood that seals your head up up nice and tight. What is left? The hands. We put on a pair of polypropylene glove liners first, then a thicker pair of polartec gloves and finally a pair of latex rubber dry gloves that seal around the wrists of the dry suit. Two more secrets. Between our glove liners and gloves go another pair of chemical warmers and, before we put on our dry gloves, we run a piece of plastic tubing under the latex cuff seals to allow warm air from the suit into our gloves. 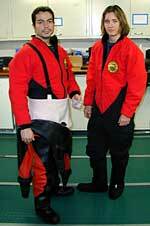 We have now completed our dry suit ensemble and can move on to the dive gear itself. 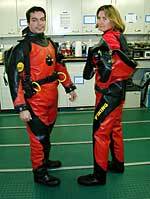 You’ve already discerned that we are wearing a lot of stuff under our dry suit with all that underwear. All warm clothing really does is trap a layer of warm air around your body; your body is what is producing the heat to keep you warm. Well, that warm air is also trapped inside the dry suit and it makes you and your dry suit very buoyant. In order to sink in the water you need a lot of weight. In fact, I wear 40 pounds of weight in a special harness that hangs from my shoulders, and two ankle weights weighing 2 ½ pounds each. I initially tried less weight and bobbed around like a cork. Believe me, once you get all that gear on and get in the water you want to sink right now. Particularly when big chunks of sea ice are all around your head. You can still breathe with all the dive stuff on, but it does feel a little claustrophobic until you get used to it, and your mobility is pretty restricted. It is very, very warm. Just getting it on is a workout and it takes about 15 minutes or so. You are very ready to step out into the Antarctic weather by the time you are done suiting up. The rest of our gear is pretty conventional stuff. We use larger fins to allow our feet to get in them with the dry suit on and a standard buoyancy compensator or “life vest”. Our regulator, or breathing apparatus, is one particular type that I won’t mention here because I’m sure I’m not allowed. It is not even designed for cold water use particularly, but it has a very low failure rate (a very small fraction of a percent) when used in sub-zero water. When a regulator does fail, it free-flows. Then it is a race to the “hole” next to the dive boat before the violently bubbling regulator drains your air tank. I had that happen on our winter cruise. My transit time from were I was at the beginning of the free-flow, to the down line on the boat, was a personal record. I stayed within safe ascent rates of course. You are no doubt wondering what it is like to get in sub-zero water, particularly the first few seconds. Surprisingly, it is not that cold except right around your lips. Everything else is covered. Sometimes you have to rinse out your mask with a little of that ice cold water, but the air behind your mask heats back up pretty quickly from your body heat. The most remarkable thing is that you mouth and jaw go numb. So… putting your regulator in your mouth is a chore. Sometimes you have to literally force your mouth open with it. It’s almost like you just got a shot of novocaine at the dentist’s. Also, as you are adjusting your gear at the surface and getting ready to descend, there are very big chunks of ice all around your head keeping you company. The main problem with diving in the Antarctic is the huge amount of stuff you have to wear to do it. If you can imagine getting all bundled up in a snow suit and then jumping underwater and breathing, that is pretty accurate. The first few times you do it, it feels positively claustrophobic and you must force yourself (really) to remain calm. Swimming any distance is tough because of your restricted mobility. Once you descend and see the underside of the ice though, you realize that you are seeing a new world. It’s not just sea ice. It is an ecosystem, and it is bigger than the entire U.S. of A. Also, it has a real fairy tale quality to it. You can get a feeling for it by looking at our photos. A few more things are different from conventional diving. Once in the water, we regulate our buoyancy exclusively by letting air into or out of the dry suit. Our buoyancy compensator (or “BC”) is only used at the surface to keep us afloat. Once we begin the dive by deflating the BC, we don’t touch it again until we are once again at the surface. Air in the dry suit not only keeps you neutrally buoyant (not floating or sinking), it keeps you warm, too. When we are down below the ice cover we are each tethered to a slightly weighted “down line” that is attached to the dive boat. Our tethers are 100 feet in length, so we are only 100 feet from safety at any time, but we have enough freedom to get our work done. This will be clearer if you look at our underwater pictures. The tethers are attached to an aluminum triangle called a “trapeze” by snap hooks equipped with an eye that allow the tether lines to pass through them. Our snap hooks are similar to the clips that are used on dog leashes. The eye where the leash is attached to the clip on a dog leash is the same place our tethers pass though on the clips we use. So… at one end of the tether is a diver, at the other is a shackle, and the line freely passes through the eye in the snap hook on the trapeze until the shackle stops it. If the diver swims toward the trapeze, the shackle sinks and takes up any slack in the line; if the diver swims away, he or she gets 100 feet before the shackle on the end of the tether brings them up short. Neat eh? Our job underneath the ice is twofold. First, we want to get accurate counts of the numbers of larval krill underneath the ice. We do this by using a thirty-foot plastic chain stretched underneath the ice and held in place on each end by ice screws. My student, Joel Bellucci, who is studying the larval krill distributions, can then film the length of the chain with a video camera and we can use visual counts or a computer program to see how many krill are in that area. Our other job is to collect both specimens of the larval krill, to see how well they are doing, and of any predators, like jellyfish, that we find eating the larval krill. Another of our USF students, Kerri Scolardi, is studying the krill predators for her graduate degree. The light underneath the ice is lovely, as you can see from the photos, and sometimes we get visits from crabeater seals to liven up the dives. Visibility is often as great as 200 feet in the winter, because there no algae in the water to make it murky. Our greatest danger is having the ice move in on top of us, denying us access to the surface. This can happen if the wind picks up suddenly and our boat, or the ice, begins to move. Our dive tenders must be ever-vigilant to be sure that a hole is kept open or that they pull us up by our tethers before we are in trouble. The matchless beauty of the Antarctic on top of the ice or below it always carries with it a barb of danger. If you get careless, it can be costly. I am here to say that it is worth it.